“Lead me to a rock that is higher than I”—What an odd little petition. To paraphrase: Get me out of here, O Lord! Lead me to a cave in the mountains so that I may stand on the ledge and listen for Your voice. Set me on a rock in the middle of a rushing river swollen by floodwaters tumbling fast and dangerous, or on a startling desert-stone formation to take my feet up away from burning sands. What are we to make of this? Sometimes the images that we conjure when we call upon God to rescue us in a hurry are amusing. 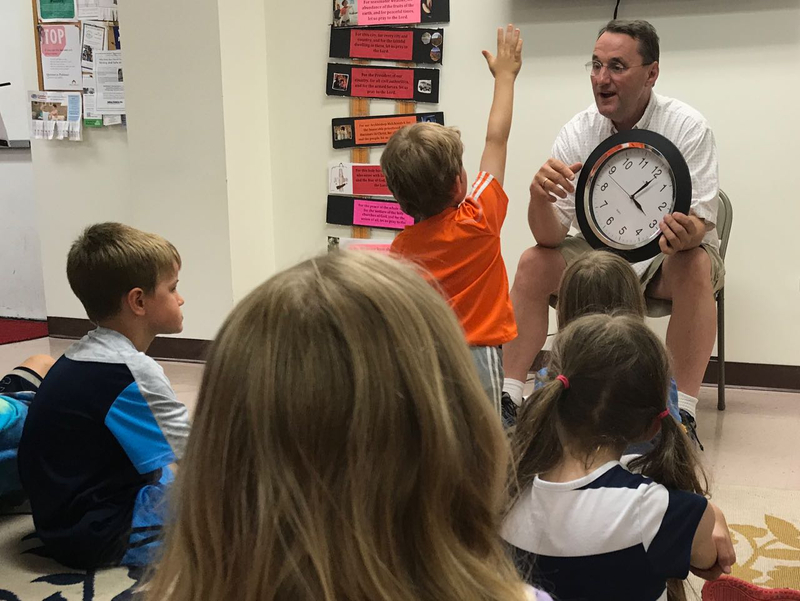 We are like a child with its arms raised begging to be picked up so to see what’s going on in a moment of confusion, or to be rescued from some overwhelming contact with the world at ground level, or simply to seek a restful moment on a strong shoulder. Sometimes we only need a moment to catch our breath. Other times we long for and seek something more enduring. The Risen Christ was and remains the Son of the Living God, second person of the Holy Trinity, but there had been profound changes at the time of His Resurrection. 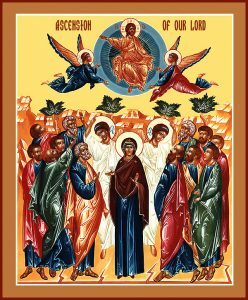 Here in the time between the Resurrect-ion and Pentecost the Apostles met Jesus the Christ who had been raised in power and in glory and whose body was no longer subject in any way to the corrupt-ion, weakness, and mortality of fallen human nature. 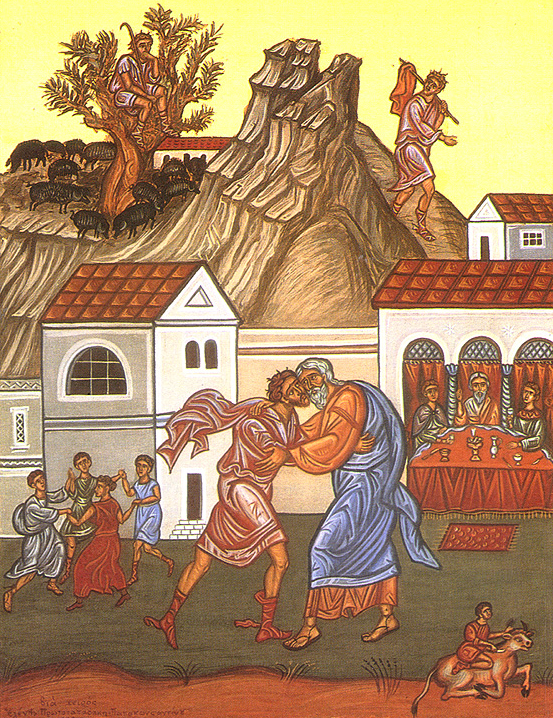 He was truly and fully the New Adam, and in this glorified and corporeal emblem of eternal life, He demonstrated to the Apostles, and to all of us, what we can also anticipate if we are, as the Son was, willing to accept gracefully the death that is granted to us by the Father, so that we may have life eternal. While we wait for the day of the Holy Spirit, we encounter a number of important liturgical moments. The first is the Sunday of Thomas where we are reminded again of Christ’s passion and death. Looking back now we realize that the Christ of our salvation is known to be true by the stripes and wounds of his passion and crucifixion. Christ Transfigured is truly Christ Crucified and Resurrected. 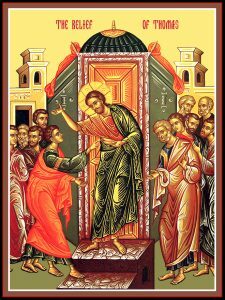 The Risen Christ breathed the Holy Spirit into the Apostles on Thomas Sunday. This is a foretelling of what is to come and why it is necessary. Pentecost comes to present, to us individually and intimately, the living power and promise of the Cross. This is a striking image and message for it harkens back to the Mosaic covenant of which the Risen Christ is the fulfillment. In Exodus 25, we read: “And you shall put the mercy seat atop the ark and in the ark you shall put the covenant that I shall give you. There I will meet with you, and from above the mercy seat, from between the two cherubim that are upon the ark of the covenant, I will speak with you of all that I will give you in commandment for the sons of Israel.” And Christ presented himself, living, to the Apostles and spoke to them of the Kingdom of God. The next three Sundays take us back to key moments in the life of Jesus, for us and for the season. The first Sunday in this grouping gives us the story of the miraculous healing of the paralytic, the next is the story of the Samaritan woman and the third is the Sunday of the story of the man born blind. The one element that draws all of these stories together into a resurrectional theme is water. The Sheep’s Pool for the Sunday of the Paralytic. Jacob’s Well for the Sunday of the Samaritan Women, and the Pool of Siloam for the Sunday of the Man Born Blind. As we wait for Pentecost these three Sundays remind us that through the Power of the Holy Spirit we all partake of the living water that comes down from heaven. The story also demonstrates that some of us will be healed indirectly by the powers of heaven, and others will receive direct healing by the power of the risen Christ. Therefore we see that some are healed by the angel disturbing the water in the pool and others are healed by Christ directly so that when the power of the Holy Spirit comes into the world at Pentecost, we are strengthened in knowledge and in power to be one body in Christ. to love and heal one another in Christ, Jesus and know that his healing power is still active in this world. 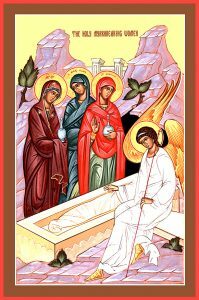 Now before we advance to the Sunday of the Samaritan Woman there is another crucial moment in our waiting for Pentecost. As there is a Sunday of mid-Lent, with its focus on the Cross, there is also a mid-Pentecost, falling on Wednesday, which has as its focus the pouring out of the Holy Spirit as we experience the pouring out of the Living Water that is Christ, Jesus. The reading for that day comes again from the Gospel of John (7:10-24) and tells of Jesus when he went into the Temple to teach in the middle of the Feast of Tabernacles. The Sunday of the Samaritan Woman is noteworthy for a number of reasons. For example, Jesus was passing through Samaria on his way to Galilee, actually to avoid a confrontation with the Pharisees in Judea who were noticing that Jesus seemed to have more followers than John the Baptist. When we arrive at Jacob’s Well—tying the new covenant back to the old—Jesus asks a Samaritan woman to give him something to drink. This is not the only place where Jesus indicates that He wants us to offer Him small, mundane kindnesses as a gesture of our regard for Him and our love. Sometimes He requests material things and sometimes he asks that we give something of our internal or spiritual selves, even if it is only refraining from some small habit of sin. He asks this of us so that we may increase the room in our hearts for Him. Then we have a most obvious reminder that Moses brought forth water from a rock, and it quenched a temporary thirst, but Jesus comes to offer us the Water of Life because so we will never thirst again. The water that He offers becomes a wellspring within us, which we can share with others, as long as we give to Him those bits of ourselves that make room in our hearts for Him. Pentecost brings with it the Power of the Holy Spirit that gives us the strength, the means, and the place—the Church—to be filled with the water coming down from heaven. 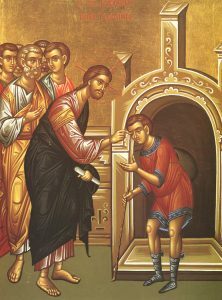 The following Sunday is the Sunday of the Man Born Blind, and here we add Light to the thematic theological symbol of Water. We are brought face to face, once more, with the Risen Light of the World, fully alive, still teaching, and illuminating the Apostles concerning the Kingdom of Heaven. A kontakion from the canon, enforces this fact: “With eyes that are spiritually blind I come to you, O Christ and like the man who was blind since birth, I cry out to you with repentance: You are a shining Light to those who are in darkness.” This vivid association between water and light cannot help but to remind us of the power of our Baptism in water and the Spirit. On these three Sundays of great miracles, we are to witness the divinity of Jesus to the world and the promise of Christ to send the Holy Spirit is to give to us, through the Church, the power to be and become disciples who will not hesitate to speak out in the assembly and give testimony to the glory of the Lord of Hosts. And finally we reach the penultimate feast, that of the Ascension and now we can return to Psalm 60 and the rock that is higher than I, as we take leave, liturgically, of the Paschal feast, and Jesus returns to the Father to be seated at the right hand. The Feast is full of references to mountain-tops. So that the Rock that is higher than I is, in fact, Jesus, Lord, Redeemer, King. 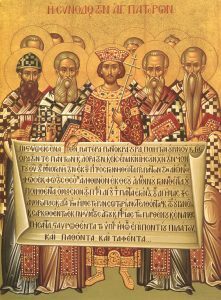 Finally, the Sunday after the Ascension is called the Sunday of the Holy Fathers and commemorates the bishops who sat at the Council of Nicea. It is not the sanctity of individual bishops that is the focus of this feast but rather the fact that these bishops gave testament to the divinity of Christ. In this way the Sunday of The Holy Fathers carries forward the message of witnessing from the Sundays of the miracles and draws attention to the intimate relationships between and among Christ, ourselves, the Holy Spirit and the Church. 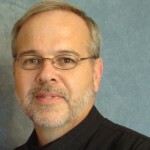 In this way, we are prepared to address the various themes presented to us at Pentecost. We begin to see the need for the illumination of the Holy Spirit so that we have the power to be and become what Christ has asked of us here, to be witnesses to the Truth, and to go and make disciples. We begin to see that for us to do these things the Holy Orthodox Faith and Orthodox Church has been bequeathed to us as the sure path to salvation for ourselves and for all whose lives we manage to reach out and touch. We come to realize that as the Body of Christ, the Church here on earth is indeed the Rock that is higher than I. Blessed journey into the Feast! 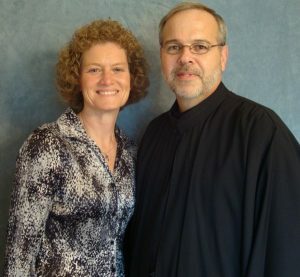 Editor’s Note: Mary Lanser is the leader of Holy Trinity’s Women’s Ministry. You can reach her at women@holytrinity-oca.org. Christmas: Will it Be a Joy or a Letdown? Many years ago, I had a conversation with a friend the day after Christmas and he said something which surprised me. He sadly said, “There is nothing more done than Christmas.” This was surprising because he was the most joyful and outgoing person you would ever want to meet—and a real ambassador of Christ. I learned much later that it was at that precise time he was going through a personal tragedy and that year Christmas was quite difficult for him. Fortunately, in time his pain eased and he was back to his old self. But I never forgot his words and what they meant to him that day. In preparing for the Nativity of our Lord, most parents try to teach their children to be joyful givers. But we all know a child’s focus on Christmas is on “getting the gifts” and it’s probably likewise true for many adults. Most assuredly, parents do their best to provide at least some of items from their child’s wish list not to mention gifts for their spouse, parents, and friends. But when the presents are all unwrapped, the Christmas meal is over, and the house is probably turned upside down from the children and all the guests—do you feel kind of let-down? Do you feel Christmas is done? In just the few short weeks preceding Christmas emotions are built up to a fever pitch: the shopping and baking, the plans to be made, and the endless commercials for the latest-and-greatest, all mixed in between the innumerable Christmas movies. To top it off, research shows that for many Christmas is one of the saddest times of the year. Not only sad memories of those who are no longer with them—but often the tragedies witnessed both in their families and in the world at large provide stark contrast to joy of the season. So, given the combination of too much emotion, too much excitement, too much to eat and to drink, and just the general chaos of the season…is it any wonder you might feel a slight letdown? If you have eyes to see it, the world is flooded with His joy. If you have the heart to receive it, your life will be touched by His. And if you have faith to live it, He will be with you all your days, and all your hours. For behold, truly we all have been given good news of great joy – for unto us, if we will receive Him, is born into our hearts Christ the Savior. And if we will receive this gift for Christmas, all our days will be blessed. So what do you really want to receive this Christmas? What will you allow God to give you this Christmas? Will it really be the gift of Himself—or in all the busyness of the season will you not take the time and really ask Him. It’s up to you. At the end of it all, Christmas can just be “done” … or it can be done rightly. 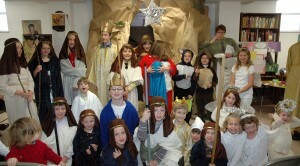 Plan to stay after the liturgy on Sunday, December 18 for the annual retelling of the story of Christ’s birth by our Church School. Our students will once again present a living icon based on the Nativity scriptures, complete with angels, shepherds, wise men, and assorted animals. 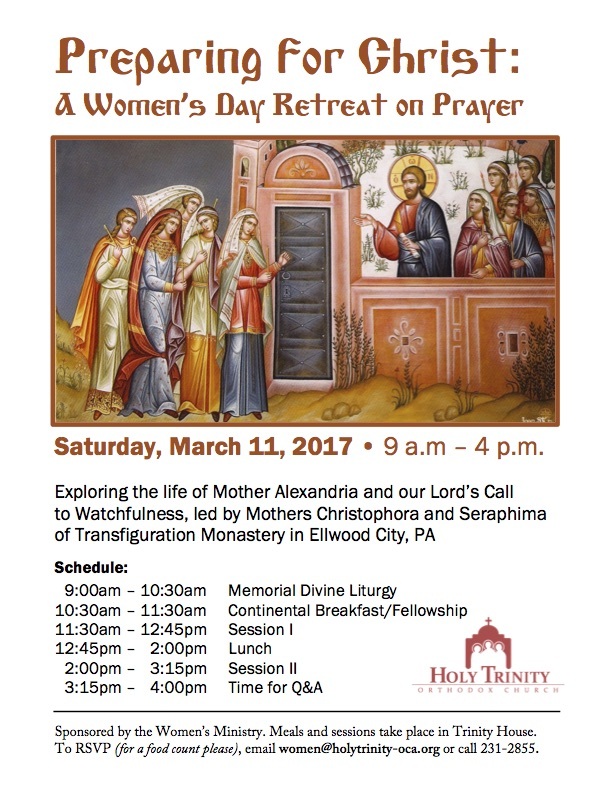 You will not want to miss it! Our faith teaches that Christ became man so that we might by grace become God. It is in this icon that we clearly see the import of this exchange. Here we do not see as we might expect, a groom full of joy and dressed up in handsome clothing, with a king’s crown on, and ribbons binding the hands of the couple as a symbol of how love binds them together. 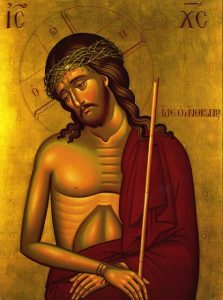 Rather, in this icon we see a sorrowful Christ, a captive whose hands are bound, who is without a wedding garment, and who is wearing a crown of thorns. 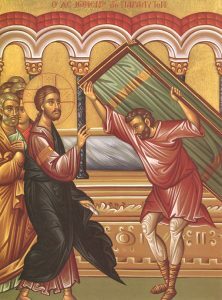 It is here in this icon that we see Christ as having fully entered into the mess, the brokenness, the sorrow, of the Fall. He comes to his bride in humble clothing to match hers. We know however, that the story does not end here. Although here He “weeps over Jerusalem” yet, “for the joy set before Him he endured the cross”—The joy over one sinner who repents, the joy of seeing His bride without spot or wrinkle, dressed in the glorious garment of His purity and light. 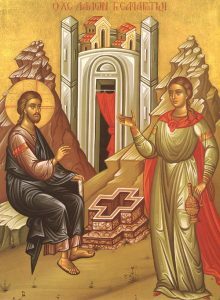 It is at Pascha that we will see the groom and bride as we expect in the fullness of joy and the beauty of holiness. Winter has the potential to give us “snow days”—days of grace and contemplation because of a winter storm, when life is “forced” providentially to slow down and our agendas com-pelled to yield to the greater work of God. It is an opportunity granted to us for refreshment if we but step into it and receive it with faith, hope, and love as God’s gift. Such is Great Lent, the Great Fast. We have entered into this providential season of contemplation and of grace: of prayer and of fasting and of almsgiving. Like the other fasts, this one is afforded to us by the Church for our renewal through the personal and communal practice of intensified spiritual disciplines. It is the Great Fast, however, because of its more intense rigor, a rigor preceding and leading us into the Resurrection of Christ God, a rigor worthy of the Church’s participation and of the Great and Holy Pascha. It is a holy season and a divinely appointed opportunity for our spiritual renewal and reclamation (shades of Ebenezer Scrooge here). 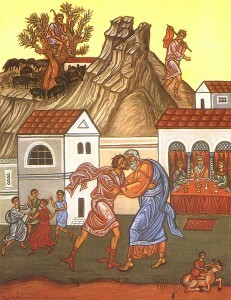 Icon of the Parable of the Prodigal Son (Luke 15:11-24), courtesy of oca.org. However, this parable of our Lord is just as much about the older brother as it is about the younger. It is a sad commentary that the elder—and obviously, more responsible—sibling could not rejoice in the return of the family’s black sheep to the fold. Perhaps it takes the heart of a father to thoroughly bask in such a return or repentance. But, at the same time, it certainly is not out of the question for such joy to be shared by all in the family, including the dutiful older brother. Sadly, despite never leaving the family estate and the preserve of his father, the dutiful elder son of the family could not tolerate such wasteful extravagance on someone who had obviously failed and proven his unworthiness! In these holy days of “obligation,” the Church invites us to “rejoice and be exceedingly glad” (Matt. 5:12) in the midst of the “duty” of our Lenten labors, basking in the sublime reality that we are profoundly loved by God our Father, though unworthy sinners that we are. Through the coming of our true elder Brother, Jesus Christ, in the flesh we have all been made children of the Most High to share in the joy of His Kingdom (Rom. 14:17-18).